I first tried goat cheese in a restaurant in a salad about 6 years ago. My food allergies had just started rearing their ugly head and I was out to eat with my family and needed to find something simple that I could eat so I didn't chew my arm off whilst everyone else ate. I went for a simple salad with goat cheese. SIL Mama thought my salad was going to be a total waste.... but fancy thinking a turophile was going to turn down any sort of cheese. The creaminess, the unique flavour, the tartness - everything. I love goat cheese and nutella sandwiches, goat cheese in frittatas, goat cheese on salads, goat cheese in pasta - goat cheese on everything! Granted, I often use it in weird combinations (case in point) and goat cheese happens to disappear in a matter of days minutes when it enters the ice cold box of doom my refrigerator - but that just goes to show how good it is! 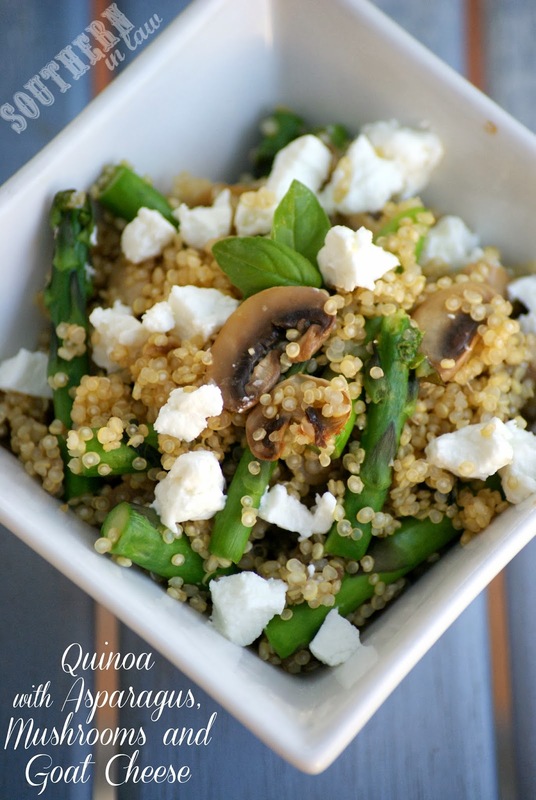 This quinoa with asparagus, mushrooms and goat cheese is so simple - but the goat cheese gives it a whole new level of flavour! We serve this both as a main or a side dish and it's so quick to put together! 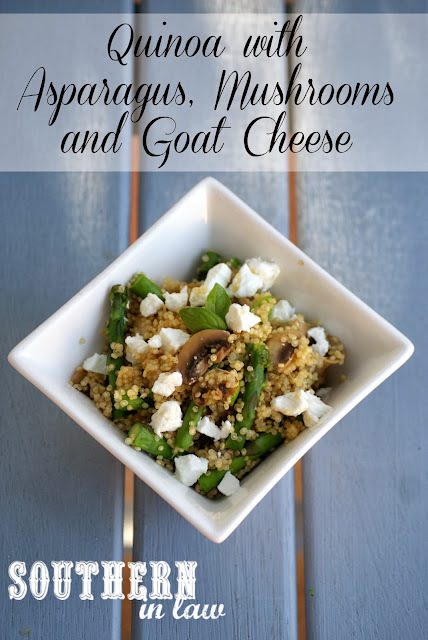 You have the slightly crisp asparagus, the juicy flavourful mushrooms and the warm nutty quinoa balanced out by the cool, slightly tart goat cheese. Helllllllloooooooooooo yum. Cook your quinoa according to package instructions and set aside. Sauté your mushrooms, asparagus and garlic until softened (adding a bit of water if needed so that they don't stick), seasoning with salt and pepper to taste. Mix in your quinoa and basil leaves, adding extra salt and pepper if desired. Mix through your goat cheese and serve immediately. But tell me, are you a goat cheese fan? What's your favourite way to eat it?